IF YOU EVER VENTURE ALL THE WAY DOWN TRENTS FERRY ROAD, you might be surprised to find that such tranquil countryside could exist mere minutes away from the Hill City. 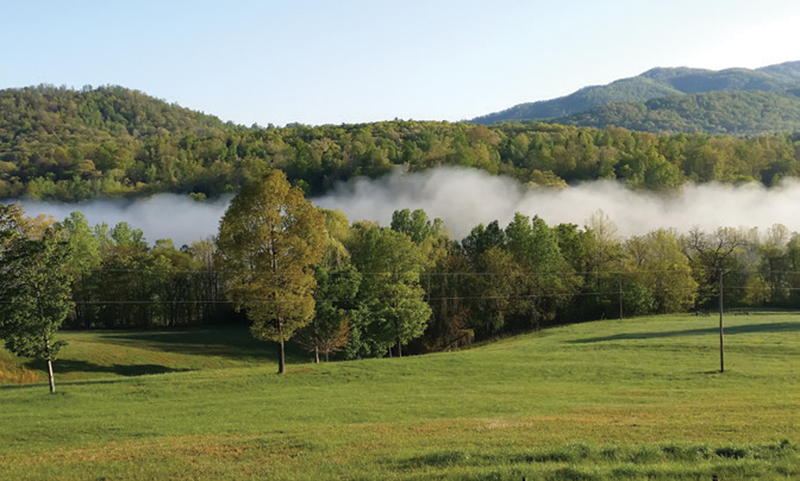 If you continue to traverse the curved mountain paths, you’ll find a quiet neighborhood tucked into the hills, spotting one log home perched high above the roaring James River. In the spring, the front yard fills with daffodils, “the scrambled-egg kind,” June Masencup offers. “They’re Bob’s favorite!” It’s fitting that the daffodil, a symbol of cheerfulness, renewal, vitality and inspiration is the flower that dominates June and Bob Masencup’s garden, when you consider the story of how they came to this log home. This is a friendly home, evidenced from the cozy, cheerful colors in the decor to June herself standing on the front porch to greet you. “Come on in! Let’s sit down! Would you like something to drink?” June and Bob, lifelong residents of the Lynchburg area, have lived in this log home on 42 acres overlooking the James River since the late 1990s. 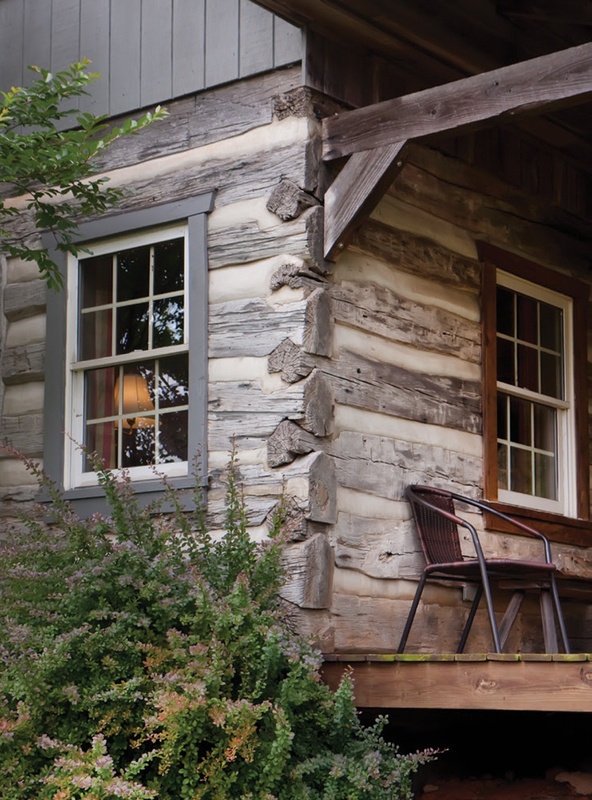 Bob always nurtured the dream of having “a little cabin for a weekend place,” he explains. He purchased the property known as Stony Point Farm in 1982 and believes it bears the appropriate name. “If you go out and stick a shovel in the earth, you’ll find loads of smooth river rocks and tiny pebble rocks,” he says. Turning this dream into reality, however, was going to take some work. Originally, a version of a log home existed on the property, but it was uninhabitable. “It was in a state of collapse,” Bob explains. “Can you imagine this: Cows used to stand around in the old, dilapidated cabin!” After contacting a representative from Appalachian Log Homes, it was determined that the wood from the cabin was sound. “He said the logs were in good shape, so use them!” says Bob. Still, there wasn’t enough existing wood to create the Masencups’ dream log home: the 1890s cabin was only 22×24, a tiny house before the tiny house movement. While the original structure provided enough space for a large family room and a bedroom, it wasn’t sufficient square footage for Bob and June and their two school-aged children. Where would the rest of the wood come from? Bob began advertising in the paper for any barns, cabins or farms in a “state of collapse,” and got a few leads. 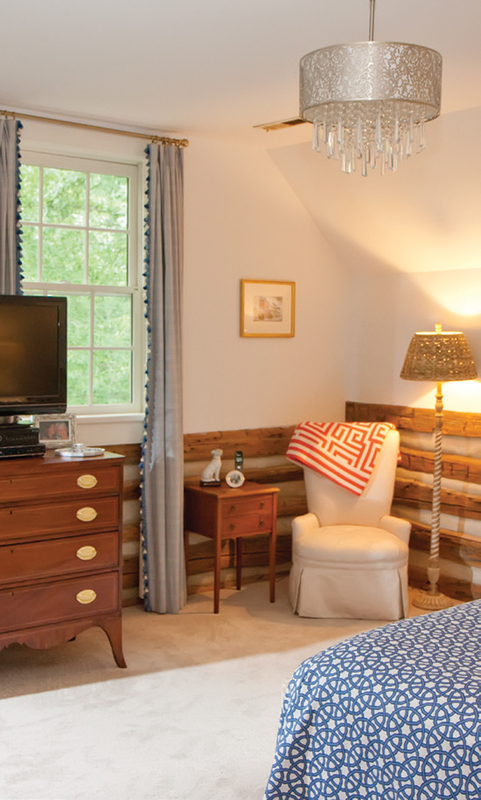 One came from a log cabin on a tobacco farm in Amherst and another from a century-old cabin in Concord, Virginia. The logs from those two properties now serve as the walls for the Masencups’ kitchen and dining room. The house was dismantled, “removed log by log and numbered,” Bob says. He explains that it needed to happen this way so that the pieces would all fit together and correspond properly when being rebuilt. Like most first-time homebuilders, June believed their home “would be up in no time!” Alas, that wasn’t the case, particularly with a project like this that calls for such expertise. The Masencups hired Pat Woody of Woody Wood Chinking in Amherst County to build this dream home, whom they say is a real expert in this area. “You have to have someone who is a specialist for sure,” says June. The centerpiece of the room—the fireplace—was the original, but the Masencups enlarged it using rocks from the original kitchen. 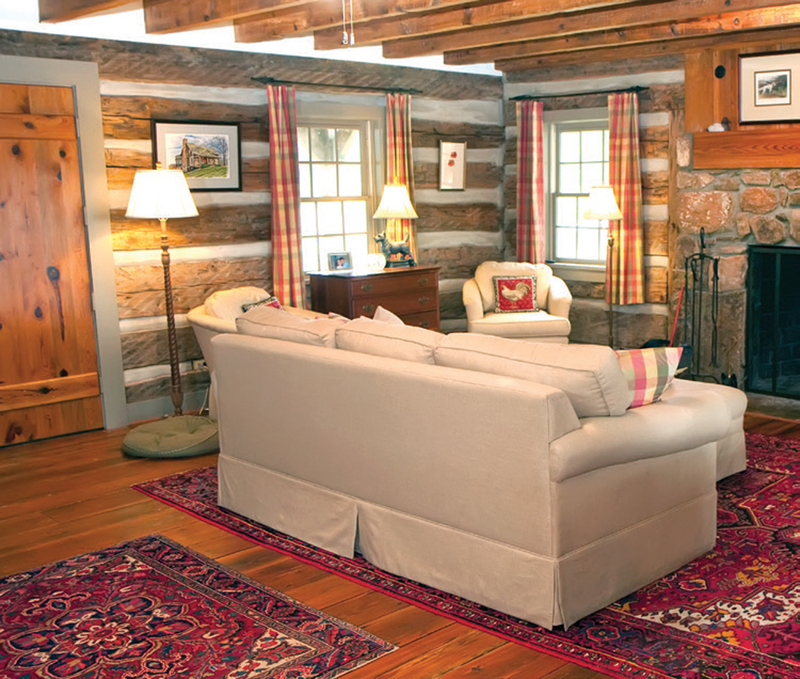 Soft beige-skirted chairs flank the fireplace; a sofa and ottoman as well as curtains in a cheerful magenta and green plaid provide softness and comfort to create a colorful, cheerful space amid the browns of the logs and steely grays of the rocks. An Oriental rug from Greenfront Furniture anchors the room, a perfect place to unwind and enjoy one of the many books from the custom built-in bookcases that also display family photos and ginger jars. Old family books live on this shelf—“my father was a book nut!” Bob smiles—as well as a volume of poetry written and published by Bob’s father. Other sentimental touches include an artistic rendering of the family cabin created by a relative, in a prominent position by the front door. The Masencups built a custom cupboard around a return vent in the living room to create more usable and functional space. “When you jam three cabins together, you wind up with corners and nooks…you gotta do something!” says Bob. Extra storage abounds in those nooks and crannies, like the Alice-in-Wonderland-like closets of different heights with doors that hide Christmas decorations and other off-season belongings. 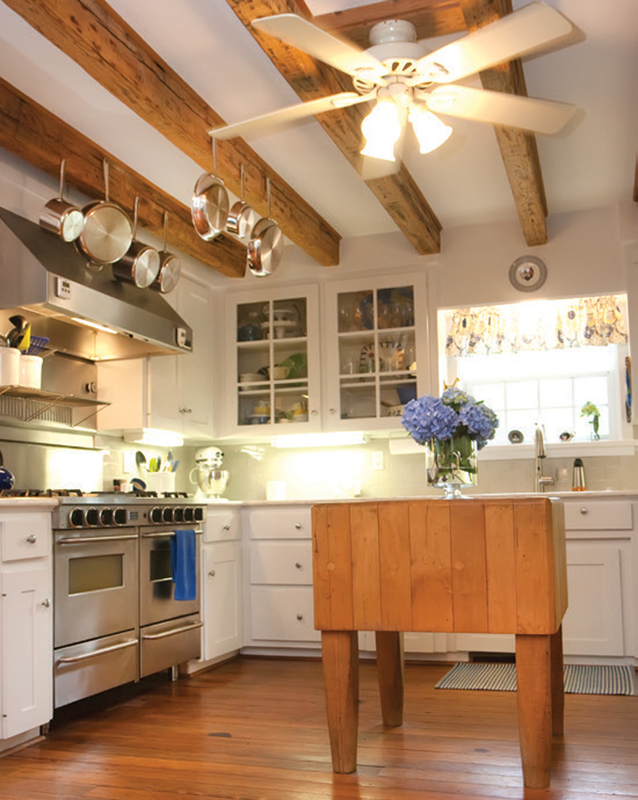 The kitchen is off the living room, a bright French country cooking space complete with yellow and blue curtains and bouquet of hydrangeas atop the butcher block that serves more as an island than just a chopping station. Except for the new quartz countertops and the touchless faucet, most of the kitchen remains unchanged from when the Masencups originally built it in 1997; June has an eye for timeless style. Her cabinets are as chic today as ever in beadboard and antique white; the heart pine floors are ideal for kitchens as well as beautiful, and her original range “works like a charm” with six gas jets, a griddle, a double oven, and a warming light, perfect for hosting their holiday dinners. The Masencups often host large holiday dinners, inviting family and friends, which speaks to their warm and generous sense of hospitality: Everyone is welcome to kick up their feet and make themselves at home in the cabin. A big drum pendant illuminates a large dining table with two leaves and a clock from Bob’s father’s office hangs on the wall—a special family memento. The dining room is such a large space for entertaining and convenient to both the kitchen and the screened porch, but June laughingly admits that they typically eat together in front of the TV on regular weeknights. A side door leads into a screened porch that offers a magnificent view of Potato Hill and Tobacco Row Mountain. A wrought-iron patio set with floral trim provides a great spot to sit and enjoy the soothing sound of wind chimes ringing in the breeze. Even though the views of the 42 acres are breathtaking, keeping up the pastoral vista requires work. Bob does the bush hogging several times during the summer, but he employs nature’s best when it comes to lawn maintenance. “Most summers we get cows—some young steers—so that they can eat the grass,” June explains. June is no stranger to the aspects of farm life; she grew up on her family farm in Forest and keeps the milk can from her grandmother’s dairy on proud display on the screened porch. Off the living room, a turn up the steps displays a collection of walking sticks, serving as a nod to the local landscape and a whimsical greeting to climbing a staircase. The second floor houses all of the bedrooms, but most of them now serve as quiet places for pursuing hobbies and relaxing. Bob and June are recent empty nesters; daughter Elizabeth, a graduate of Ole Miss, is the athletic director at E.C. Glass High School and son Carson, who was named after Bob’s father, graduated from Liberty University and now lives on June’s family farm in Forest. 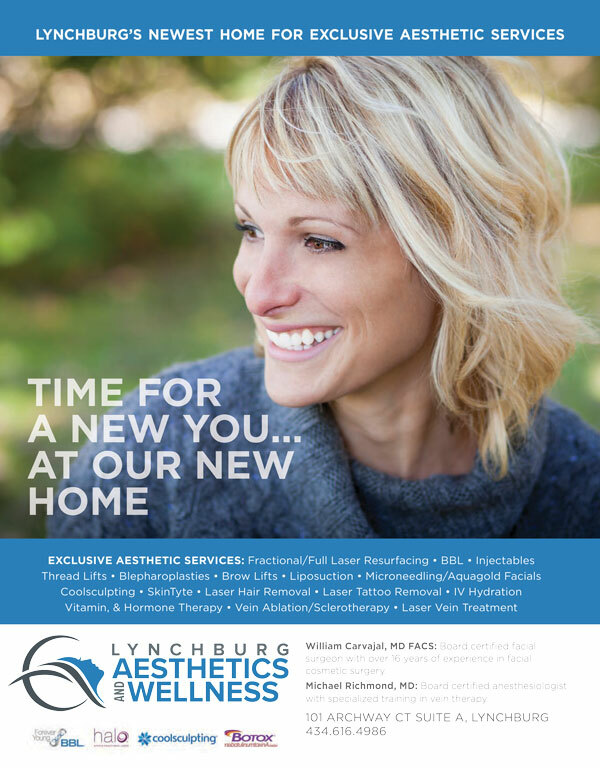 Even though the Masencup manor is just minutes from the city of Lynchburg, the home is in Bedford County. When they were growing up, June was dedicated to hauling her kids back and forth to town, especially Carson, since “he played basketball, so that was another ride out to the school and back!” June remembers. Now Bob and June live in the cabin with their dog Cosmo. The first room at the top of the stairs is Elizabeth’s old room, which June has decorated with fun, upbeat touches of robin’s egg blue and complementary orange and a brilliant chandelier that June jokingly refers to as her “disco ball.” June likes to use this room as her own personal space for relaxing. A step up and down leads to Carson’s old room, which features a steep staircase right within the bedroom—these were the steps providing access to the kitchen area in the original cabin. June laughs at the memory of Cosmo (the family dog) barking like mad at Carson: “Cosmo did not like him going up these steps from the dining room!” As empty nesters tend to do, the room is now the official guest room but more regularly serves as a daily creative retreat for June to pursue her new hobby of painting. A small easel displays her first piece, a bouquet of colorful flowers upon a robin’s egg blue background. “June likes to paint up here because the lighting is just so good,” Bob explains, motioning to the outpouring of natural light from the room’s large, clear windows. The end of the hallway leads to the master bedroom, which happens to be the only room in the house without logs in the walls. Bob explains that the room doesn’t have logs because they didn’t exist! “I didn’t have any more wood,” he says, noting that all of the wood from the three cabins stayed within the parameters of their original floor plans. The Masencups like having just one room without any logs in it, adding that a log home doesn’t have to contain only logs. June hung a sunburst mirror on these “real” walls along with the poems Bob wrote upon the birth of each child in frames. The room is furnished with built-in cupboards and cabinetry used for storage and displaying favorite everyday items. A glass-paned door leads out to a private deck with a shower, or what Bob jokingly refers to as the other “half-bath.” The simple, rustic outdoor shower provides a place to shower with a view of the rolling river and countryside, but with plenty of privacy to enjoy outdoor bathing. A morning spent at the home of June and Bob Masencup not only reveals a home made of truly reclaimed materials, but shows that it’s entirely possible to live in and decorate a log home where the logs serve as the backdrop to the story taking place—a story of pursuing a family dream.